bl.uk > Online Gallery Home	> Online exhibitions	> Asia, Pacific and Africa Collections	> Bruhma Ghat, Benares. 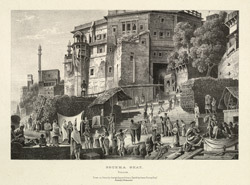 Plate 4 from the second part of James Prinsep's 'Benares Illustrated'. Prinsep (1799-1840), an antiquary and colonial administrator was assay master at the Benares Mint between 1820-30. The lithographs published in this collection were based on his original sketches of the various views of the 'holy' city of the Hindus. Of this view he writes: 'The ghat is ancient and of irregular form; it derives its name from a temple of Shiva, under the title of Bruhmeswur situated at the top of the stairs...The temple and ghat were repaired (perhaps built) two hundred years ago by the Marhattas, and again recently by the ex-Peshwa Baji Rao. From the number of Marhatta families residing in the neighbourhood, and the comparative privacy of the spot, it is by courtesy set apart a a bathing place for their women...They resort hither in groups, with their children and female servants.